Economist and author Jim Rickards, discuss reserve currencies, BRIC nations, and the IMF in the context of financial warfare. Jim Rickards appears on CNBC where he discusses the gradual move away from the use of the US dollar by countries such as China and Russia. Jim Rickards talks with Paul Buitink about the crisis and his presentation for 20 September in Rotterdam at the event. Jim Rickards, Senior Managing Director at Tangent Capital, explains how the new bank differs from the World Bank and the International Monetary Fund. New York Attorney General Eric Schneiderman accused Barclays of allegedly telling its customers that it would protect them from high frequency traders, while actually doing the exact opposite and accommodating them. Erin takes a look. Then Erin brings you part two of her interview with economist and author Jim Rickards. They discuss reserve currencies, BRIC nations, and the IMF in the context of financial warfare. After the break, Erin brings you the best of week. Catherine Austin Fitts, Divya Narendra, Cullen Roche, Marshall Auerback, and Marc Chandler all weigh in. The Federal Reserve, the central bank of the U.S., is nearing the end of its ability to manipulate the U.S. economy without producing consequences worse that those it set out to avoid in 2008. The Fed has no good exits from seven years of market manipulation. If it continues its current policy of reducing purchases of assets, the so-called “tapering,” it risks throwing the U.S. into a recession. If it reverses course and pauses the taper and later increases asset purchases, it risks destroying confidence in the dollar among foreign creditors of the U.S. Both outcomes are potentially disastrous, but there are no good outcomes on the horizon. This is the result of manipulating markets to the point where they no longer function as markets providing useful price signals and guiding the efficient allocation of capital. Today markets are a mirage, created by the Federal Reserve, which is caught in a prison of its own device. Since 2007, the Fed has tried to revive the U.S. economy through monetary ease. It began with a series of interest rates cuts, but by late 2008 interest rates had effectively reached zero and the Fed resorted to money printing, called quantitative easing or “QE” as a way to continue to stimulate nominal growth and aggregate demand. The money printing is done by purchasing bonds from banks and paying for the purchases with money that comes from thin air. This money printing has continued in three programs over six years called QE1, QE2 and QE3. The most recent program, QE3, began in September 2012 and was open-ended as to duration and the amount of bonds being purchased. By late 2013, the Fed’s balance sheet has swollen to over $4 trillion due to the money printing. Because U.S. growth appeared to be stronger in late 2013 and the unemployment rate had fallen sharply, the Fed began to reduce the rate at which it printed money. This was the “taper” of asset purchases. However, the data on which the Fed relied was highly misleading. U.S. growth had been propped up by inventory accumulation. The declining unemployment rate had been caused not by job creation but by people dropping out of the labor force. In fact, the Fed had not tapered into economic strength, it had tapered into weakness. This quickly became apparent when U.S. growth in the first quarter of 2014 showed a decline and as the U.S. labor force continued to shrink. Many other negative signs appeared including weak retail sales, declining real wages, lackluster consumer confidence, and a cooling-off in the housing market. In short, the U.S. economy was showing signs of sharply declining growth if not outright recession. This should not have come as a surprise. Those who focused on the tapering in December 2013 did not recognize that the Fed had tapered twice before. The end of QE1 in June 2010 was, in effect, a 100% taper. The end of QE2 in June 2011 was also a 100% taper. So, the famous taper of December 2013 was actually the third time the Fed had tried to withdraw from money printing. The first two times were failures as evidenced by the fact that the Fed had to launch new money printing programs after each withdrawal. By early 2014, it appeared that the taper of QE3 would also be a failure. Depending on economic data in coming months, the Fed may have to pause the taper before it is completed late in 2014. Even if the Fed does not pause the taper but completes the process of reducing new asset purchases to zero, it appears likely that the Fed will have to increase money printing in 2015 in what will no doubt be called QE4. The U.S. economy has not shown an ability to achieve self-sustaining growth, so continued Fed money printing is needed to keep the economy growing at all. But money printing carries its own risks. Foreign creditors of the U.S. are watching the Fed’s money printing closely and are visibly uncomfortable. Major creditors such as Russia and China are taking steps to insulate themselves from the potential for inflation in the near future if the Fed’s QE money printing programs continue. Treasury data shows that net foreign purchases of U.S. Treasury debt have dropped sharply over the past year. Russia has been dumping U.S. Treasury debt since late 2013, partly as a result of fear of U.S. economic sanctions and partly out of concern about the fate of the U.S. dollar. Both Russia and China have been buying enormous quantities of gold to hedge against possible U.S. dollar inflation. If you would like to continue reading follow this link. Spoke to head of global commodities trading at LBMA bank. He expects a #gold "demand shock" from #China credit crisis. May be game on there. 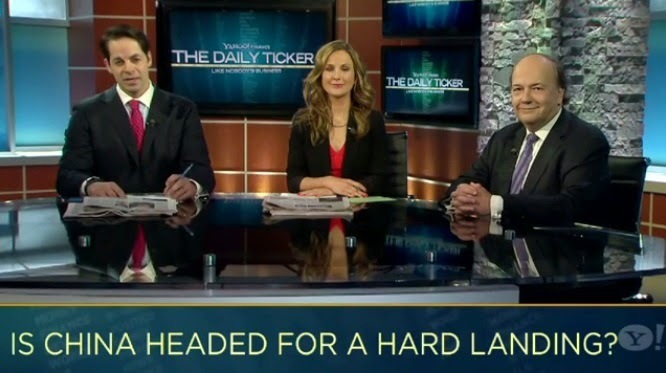 The Daily Ticker's Aaron Task and Lauren Lyster discuss the drop in Chinese stocks and economic growth coupled with rise in rates. Silver Bullion Bars 999 Choose From 10-100oz Pure Silver Trusted Bullion Dealer - Buy Now! I have a whole chapter in the book, "The Death of Money", just on China. You know, the wealth management products are a Ponzi and that's not from me, the Chairman of the Bank of China said they're a Ponzi, so you've seen the Chinese banking officials saying the same thing. I've been out there, I expect you have too, I've seen the ghost cities, I've seen them as far as the eye can see -- completely empty. And people say, "Well, they'll fill up in the years ahead." No, they won't. I mean, that migration from the countryside to the cities is largely over, number one. Number two, it doesn't take into account obsolescence. You can't mothball a building; you have to occupy it and maintain it. Limited time promotion: FREE SHIPPING on emergency survival food, orders over $87. Act fast, this won't be around forever. I expect a pause in the taper later this year. But, look, this could run on well into 2015 but the problem is the scale of it. In 2008, all we heard about was "too big to fail"; well, guess what, the five biggest banks in the U.S. today are bigger than they were in 2008. They have a larger percentage of the banking industry assets, their derivatives books are significantly bigger, you know, so the problem is that the whole thing is bigger, which means that... risk is an exponential function of scale; when you triple the system, you don't triple the risk, you increase it by a factor of ten or more and this is what we're up against, this is what we're facing. Could start anywhere, could start in China.